Hi guys! I thought I'd share my interview with Art Vibes on Tumblr: http://artvibes.tumblr.com/featured Thank you Rockie Mercado for the interview! Brief description of your art background: Lifelong doodler. 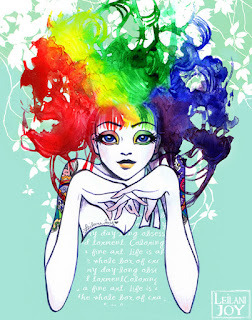 AA in Applied Art and Design from Sierra College and a BA in Fine Art: Illustration from the Academy of Art University, San Francisco. Do you prefer traditional, digital, or both? Depends on the look I want and the result I want- however I’m a traditionalist at heart. I like to able to touch and hold my final piece of artwork. However digital medias have a great way of speeding up some traditional processes which is great for tight deadlines. Even when I do digital work however, I still want the final piece to look like it was done traditionally. I’m not a big fan of super airbrushed “digital” looking work. What’s your favorite tool right now? I would have to say my hands…. Weird as that sounds! I like to actually get some of the paint or ink on my hands and use my fingers to apply the pigment. I love the idea of my actual fingerprints being hidden in my work. It’s like a secret I have with the final piece- like a hidden signature. How would you describe your current style? 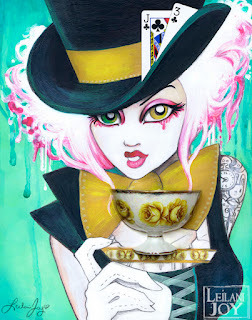 My style is influenced by many different sources from – anime and manga, to fashion illustration, Art Nouveau, and abstract and surreal art. Currently, I love exploring the use of figurative work combined with organic and graphic shapes. What do you think you draw well? Depends on the day! I have days where the work just flows naturally and I love every minute of it and I’m able create something that looks even better than it did in my head. However other days it’s the exact opposite; I struggle, and hate every drawing I do. I do think I have the core skills- which I’m grateful for, and owe to my formal art education, but there are still days when I just can’t get the result I want. What do you need to work on? Time management is big one for me. I often have MANY irons in the fire and get overwhelmed by balancing my commissions, fine art, emails, and art business. I could definitely improve on scheduling and managing my time efficiently to cut back on stress and wasted time. Who is an artist you admire? Oh there are SO many! 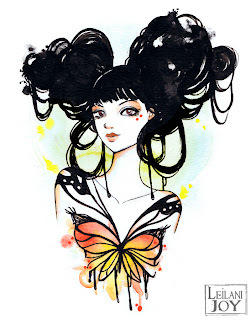 Camilla d’Errico is big one for me- not only for her amazingly beautiful work but also her incredible tenacity and ability to brand herself and market her work. I’m also very inspired by Erte, Alphonse Mucha, David Downton, Stella Im Hultberg, Stina Persson and CLAMP. What inspires you? Anything and everything honestly! I never know exactly where it’s going to come from. Sometimes it’s song or film I saw or sometimes I dream I had. 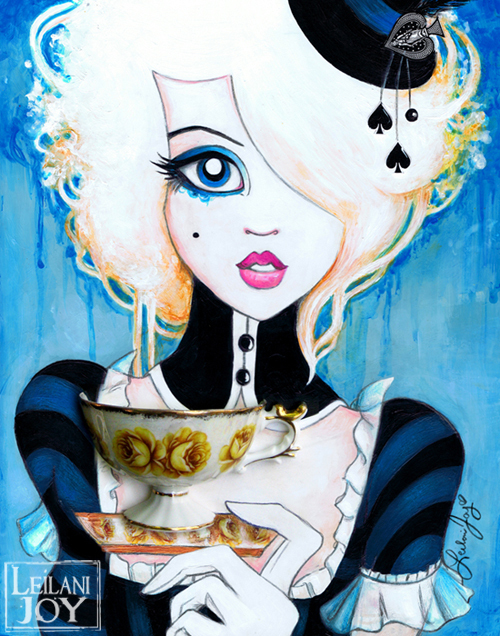 Many of my pieces are inspired by existing characters that I want to do in my own style, like Alice in Wonderland or Madame Butterfly. I’m also inspired by (or perhaps obsessed with) Rorschach ink blot tests. I love seeing something in them and working them into my pieces. Someone recently referred to my characters as “Ink Blot Girls” and I totally love that description so I’m thinking of calling my character’s Leilani’s Ink Blot Girls! How often do you draw? I wish I could ever day- but part of the trade off of running my own business is also doing all the not so fun business stuff. I’m working on balancing it a bit more though so I get to do more drawing and creating and less paperwork. What medium do you work in most? I switch back and forth between Acrylics and watercolors. I love them both so much I can’t commit 100% to either one. It depends on the kind of piece I’m doing. If I want a more developed full painting then I go with the acrylics but if I just want to so something quick and more conceptual and expressive I may go with the watercolors. What medium do you want to try? I’m open to try anything! I have tried many mediums from gouache to scratch board and even sculpture… but I’ve always been curious about water soluble oil paints. There are a lot of great perks to oil paint and I love the luminosity and blending ability of them- however I hate using them because they smell toxic and I’m not a fan of using turpentine and other chemicals. It’s also messy and takes forever to dry. I’ve heard that water soluble oil paints have perks of both acrylic and oil so I’ve always been curious to try them. Have you ever sold your work? Yep! I make my living selling my work. How often do you buy art supplies? Depends. I probably replenish a few supplies a month. I’m kind of abusive to my paint brushes- which I know it terrible…. So I do have to replace them somewhat often. How much do you typically spend on art supplies? Again, it depends. It’s different every time depending on what I need. What kind of art classes have you taken (if any)? Way too many to list- but if I had to generalize…. Somewhere around 7 or 8 figure/anatomy/portrait drawing classes, still life painting, figure painting, portrait painting, digital painting, figure sculpting, color theory, design principles, 5 or 6 classes on Adobe Photoshop, Illustrator, Corel Painter, and Flash. I’ve taken 4 or more classes in illustration and also comic book art and inking. I’ve also taken some web design, and classes on portfolio development and art marketing, AND of course 3 years of Art history. PHEW! I’m exhausted just trying to remember all these! What’s your most used color? I’m probably a little more partial to blues, greens, and violets, but honestly I love all colors and use all of them regularly. What’s your least used color? Since I work with a lot of vibrant, pure colors I suppose I would say I’m not real big on earth tones, and browns but I think they can be beautiful in the work of other artists. I think Audrey Kawasaki is a master of earth tones and muted palettes. What style(s) of art do you dislike? Hmmm…. Touchy question…. Especially since I wouldn’t want to insult anyone… I suppose if I had to answer though I would say I’m not a big fan of super rendered “shiny” fantasy art- Like overly digital huge breasted plastic looking females and greased up bulging muscled dudes. Not a big fan of that stuff…Ha! Are there any specific things you do as part of your creative process? I definitely have a process- I think it comes across pretty well in my videos. I usually come up with a concept and then do some research and development. Sometimes I draw first- so I don’t get too influenced by my research, but other times I need some inspiration to get started. If I have a pose in mind- many times I shoot my own reference since it’s often too hard to randomly find a photo with the pose you have in mind. From there sometimes I’ll do some super rough thumbnail sketches before doing a more developed sketch. Next I’ll take my sketch and do some color samples in Photoshop before I start the final painting. What’s your favorite thing about being an artist? My favorite part of being an artist is having the ability to create something that has never existed before. I’ve always been very enthralled with that concept- That I can actually make something from my own imagination and share it with others. Growing up, art was always my escape. I could create worlds, characters, and stories in my own head and make them real. It’s incredibly rewarding to make a living doing what I love, and sharing my passion with others that like what I do. There is nothing more rewarding then meeting a customer or fan at a show and having them tell me that’s I’ve inspired them somehow and that they love my work and display in their home. It’s awesome! What’s your least favorite thing about being an artist? I can be my own worst enemy and harshest critic when it comes to my work. I can’t say I suffer with artist’s block too often- on the contrary I usually have more ideas than I could paint in 5 lifetimes, but I do find that 99% of the time my paintings don’t look as I envisioned them in my head. On a rare occasion they turn out better than I planned, but for the most part every painting goes through a “struggle” stage, where I consider scraping it altogether. I have to force myself through this awkward stage, and most the time I’m quite happy that I did. I think I’m coming to an acceptance that all paintings must go through this “ugly” stage and with some patience and perseverance it will turn out in the end, and if not? I can always do another one! How long do you typically spend on each piece? This depends on many factors- size of painting, amount of details and different elements, medium etc. Some smaller pieces I can do in a day or two- other more developed and complicated pieces take several weeks to over a month. 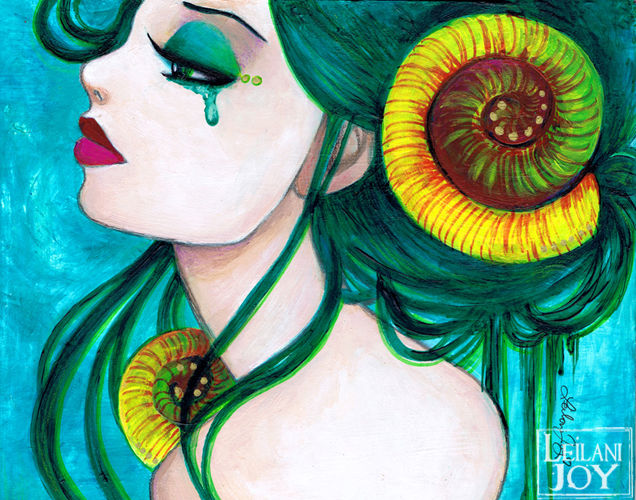 How attached are you to your art (do you have a hard time giving it away or selling it?) I was a lot more attached when I first started out- but now that I sell my pieces so often I really don’t get too attached. I’m very happy when a piece finds a new owner. With the ability to make high quality prints and canvas reproductions- I can always make myself another copy if it’s a piece I’m really attached to. I’ve always been eager to make a career selling my art so I’ve always welcomed having my work purchased. Do you want a career in art? If so, what? I have one. ^__^ I’d like to call myself a hybrid between a fine artist, illustrator and business owner. It definitely has it’s pros and cons, but I feel so fortunate to be doing what I’ve always wanted to do! Do you have any tips/secrets to share? 1. Get Educated! In my opinion art education is a must. Indeed, there are a select few that are very successful being “self-taught,” however I strongly believe that classical training and learning from those who have mastered the craft will enhance your natural talent and make you more competitive professionally. Many community colleges offer affordable art classes and online classes are becoming more accessible and are also more affordable options that formal art schools. I’m constantly re-educating myself even post college and I think this is a must! Never be satisfied where you are right now- strive to make every piece you do better than the last! 2. Work harder than you thought possible! Be prepared to give up your evenings watching TV, and many of your weekends. Being a professional artist is more than a full time job, it’s a way of life. I’m pretty much a one woman show at the moment. I do all the paintings, do all the shipping, maintain all my websites and social networks, and run my art store business. 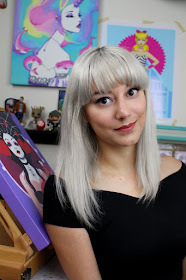 Before I was able to do art full time, I was working two jobs and painting late at night and on weekends to get my business started. I’m willing to devote myself 100% because I feel so passionately about my artwork. 3. Be yourself and Don’t give up! It may sound cliché- but determination will always give you an edge over other artists, even if they are considered to be more “talented.” One of my instructors once said that being a successful artist is “10% talent and 90% tenacity.” I strongly believe in these words. You should always strive to improve your craft, but never try to be someone you’re not. You won’t get far trying to ride the coat tails of another artist and simply copying what they do. Being a successful artist is more about finding and embracing your own unique style than out doing someone else. So stay true to you, throw in lots and lots of hard work and you will find success! "Alice" and "The Mad Hattress" Acrylic and 3D Mixed Media on Panel. 2011. 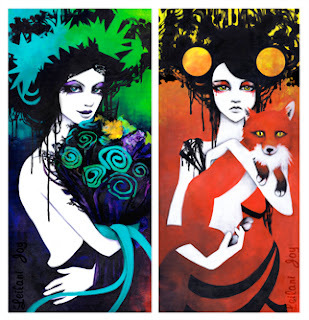 These two pieces are my interpretation of the beloved characters from Lewis Carroll's Alice in Wonderland. I've always been in love with story and Disney film. The concept of dream world where anything is possible has always been an intriguing concept to me. I think some form of "Alice" comes through in many of my pieces. "Flora" and "Fauna" Acrylic and Mixed Media collage on canvas. 2012. These two pieces are personal favorites of mine. I purchased these two elongated canvases at a “buy one get one free” sale at the art store and decided I wanted to do a diptych that complemented each other. It was a beautiful spring day and I set up to paint outside- suddenly I was inspired by the idea of doing my depiction of the roman goddesses of flowers and animals. I did some very quick sketches before I started did limited research for references. I did a more direct painting technique than I usually do and I was very pleased with the results. From start to completion these two pieces probably took 2 to 3 weeks to finish. “Tempest” Acrylic and mixed media on masonite. 2012. Tempest was one of those very quick paintings that I didn’t do any preliminary sketches of before I started. I usually do several sketches and drawings before starting to paint- but on this particular day I just wanted to paint directly and see what happened. I painted “Tempest” in about two 3 hour sittings and I was delighted with the result. Though it’s a simple profile portrait- I was very pleased with the expressiveness of the piece and the inspiration of mermaids and fairies. Tempest continues to be one of my best selling prints. "Spectra," Watercolor, Ink and Digital. 2010. This piece is also one of my favorite pieces. She came to me in a dream. I dreamed that I saw a girl with huge rainbow hair riding a horse and the hair was blowing wildly. I woke up and I just had to create her. I love the piece because it has a quiet thoughtfulness while also being extremely loud. Something about her just always makes me smile. “Soleil” Watercolor and Ink. 2013. This piece was inspired by a character that I created for an art contest that I held for my fans. I wrote three different character descriptions and challenged my fans to create their own versions of my characters. After seeing all the inspiring entries I decided it was only right to rise to my own challenge and create my versions of the characters. My version of Soleil was inspired by monarch butterflies and I’m quite pleased with the simplicity of this piece and her coy expression. your problem will solve like a magic and you get the quality graphic work.